Here’s a photo of the bride and myself at the wedding. 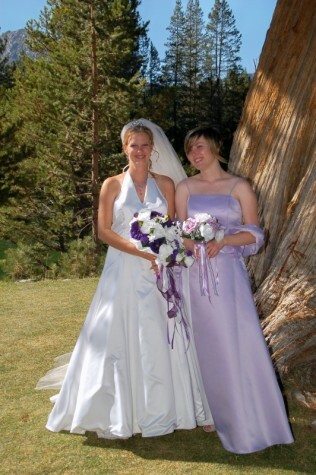 It was a nice wedding, outdoors in South Lake Tahoe. It was perfect weather, sunny and warm. I had on sunblock, which is good, because my back was in direct sunlight throughout the ceremony. Queen B (not that B, her name starts with a B) and I have been friends since we were both three years old. My parents moved into the the house next door to her parents. My folks lived in that house for 26 years. Her parents are still in the same house. We say that we are more like family then friends, because we just don’t have that much in common, other than the whole history of our childhood. When you’re in a wedding, lots of people take lots of pictures of you. This is from the first batch I’ve seen. I’m positive that there are more. If there’s any more good ones, I’ll post them. What do you think of that dress? Previous Previous post: Searching . . .